This cover will beautifully frame you paper, we make them in two versatile sizes to fit both A4 and A5 sized paper. This custom menu cover Will hold one sheet on either side so you can show up to two sheets of paper. 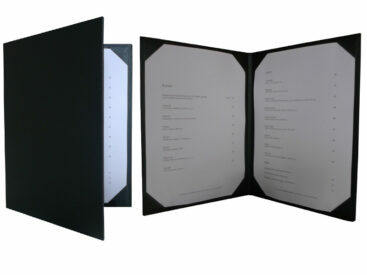 This dye cut frame menu cover is ideal for smaller menus. You simply slip the edges of your paper into the corners and your done. SKU: DCFA4 sample. Category: Samples. Tag: productSample.